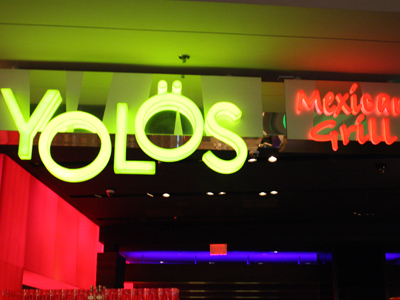 Grab the fiesta feeling at Yolos in Planet Hollywood. From daily creations of salsa, to flautas, to taquitos you won’t be disappointed with this Mexican fare prepared with the flavors of international cuisine. The vibrant and dynamic colors of this eatery bring home the feeling of a true urbane cantina. Taste the freshness of a fresh fruit margarita, or enjoy one of the 60 tequilas offered while kicking up the feeling of an authentic fiesta at Yolos. From karaoke to drink specials, there’s always something going on at Yolös! Swing by and join the party! Try their Margarona, a Margarita with a Corona inserted upside down so you get a blend of lime and Corona with each sip.